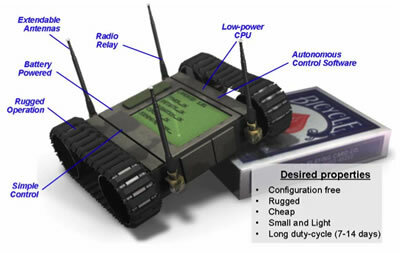 LANdroid WiFi robots are the latest items from DARPA's technology wish-list. DARPA is soliciting proposals for intelligent autonomous radio relay nodes that are able to establish mesh networks in urban settings. 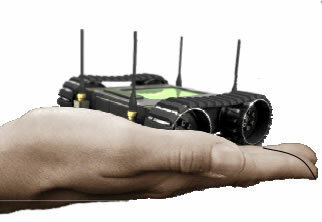 Ideally, a LANdroid unit would consist of a robotic platform - small, inexpensive, smart, and mobile (as shown in the photoshop artist's conception above). Warfighters would carry lots of them (they should be roughly palm-size) and then drop them as they go. Together, the units would form a self-healing mesh network - multi-path, multi-hop and multiply connected. If a particular unit is taken out by the enemy (or possibly grabbed by some kid as a cool toy! ), the network will route around the lost transmitter. LANdroid WiFi robots are the latest items from DARPA's technology wish-list. DARPA is soliciting proposals for intelligent autonomous radio relay nodes that are able to establish mesh networks in urban settings. 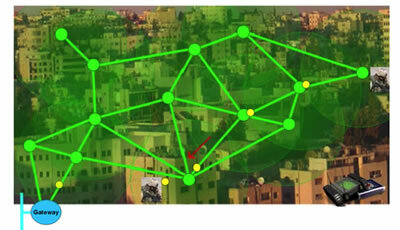 The DARPA guys should check out this multi-hop RFID-based network of tags used to track monkeys. The idea is that the tags placed on the tracked animals will themselves form the network. A similar kind of model is used in this RFID Sensor Tag Shower For Disasters; this idea uses tiny RFID tags to blanket an area to provide a quick network for rescuers. 'The real border was defended by... a swarm of quasi-independent aerostats.' - Neal Stephenson, 1995. '...you look like a big steel gorilla...' - Robert Heinlein, 1959. 'Suited up, you look like a big steel gorilla...' - Robert Heinlein, 1959. An attack can take many forms.